Protected content the 100th anniversary of the founding of the "Bauhaus" design school. For the centenary, many events will take place in Berlin (Weimar, Dessau and all over Germany) to help us to understand the meaning of the Bauhaus, at that time and nowadays ( Protected content ). 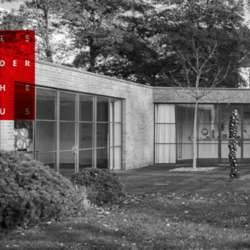 Therefore, I would be delighted if you join me this 27.1 to the Protected content , last building designed by the architect and last Bauhaus director before his emigration to the U.S. in Protected content . So lets meet at 13:00 Protected content to know us and enjoy a bit the house before the crowds arrive. The admission is free from 11:00 till 17:00 and the exhibition will be open from 28.1 till 14.4.2019.